The Japan! Japan! Blog: Cherry Blossom Forecast for 2013! 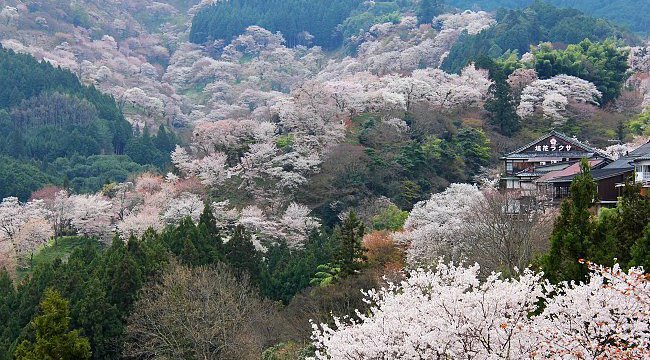 Photos of blooming sakura trees in Yoshinoyama, from japan-guide.com. This is the best resource I found on the web for cherry blossom forecasts. Note that these forecasts only come out usually in February, and they could change as the dates near. Also, note that the dates are different per location. Basically, the more up north a place is, the later the cherry blossoms bloom. Note also that there are two dates: when the cherry blossoms start to open up, and when are the best viewing time. This year's dates more or less coincide with the average dates; i.e. within the first week of April for best viewing. Sometimes, it's earlier; sometimes, it's later. Last year, the best viewing time in the Tokyo area started probably around the 2nd week. We were in Chidorigafuchi on April 9, I think. Most hanami (literally flower+see = flower viewing) areas are packed with Japanese having some picnics underneath the trees. It's most especially fun to do that while the petals are falling down like snow, but very slowly. At Chidorigafuchi though, they don't allow picnicking. You have to walk continuously because there are so many people there. Chidorigafuchi is also a good place to do hanami in the evening as the lighting adds some dramatic effect to the sakura trees. Chidorigafuchi, by the way, was my Nihongo teacher's recommended place for hanami in Tokyo.